carly tee: essentials by ellen late summer 2016 hop! Today is a super exciting day and I'm so glad you are here to join in the Essentials By Ellen Late Summer 2016 hop! You should be arriving from Jennifer McGuire's blog, jennifer mcguire ink. The largest pineapple from the set makes a great window in the front of a card! I paired it with gold embossing powder, Pink Fresh paper and flowers stamped in Distress Ink & watercolored. Next I played with the Lovely stamp set, full of amazing sentiments! I LOVE the sentiment "you are enough"! I think it should be a daily reminder/mantra for everyone. I paired it with watercolored flowers from the Stay Golden die set and more gold embossing powder. Before you go, there's one more awesome thing, yay! I also get to give away an Essentials by Ellen stamp set! 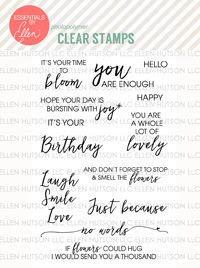 The winner may chose ANY Essentials by Ellen brand stamp set (Maximum value $25 USD) currently in stock at ellenhutson.com To enter my giveaway, please leave a comment on today’s post by Tuesday, August 23rd! Your next stop on the blog hop is Carolyn Peeler's blog, cut n' paste. If you get lost, please visit the CLASSroom blog for a complete list of all the designers. Love that flower cards! So soft and pretty! Love the soft colors you used! Such pretty cards! Great pineapple! Love the flower card - beautiful colors ! I just love the pastel colors you used on the stay golden card..adorable ! So pretty. What great cards. fab release. Love the "You are enough" card... something we don't say often enough! I love your cards and the new products! Beautiful soft and pretty cards! I love the gold thread wrap on the watercolor flower card, such a pretty detail! 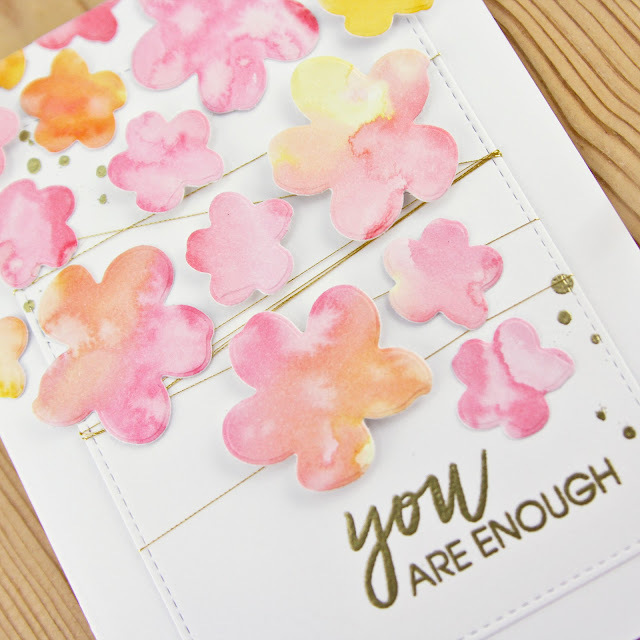 Beautiful cards and love the one with the "you are enough" sentiment. Very pretty. Beautiful cards Carly! Love the colors! These are great cards especially the colors of the soft flowers. Love how you used the bigger pineapple die to cut a window - clever! Both cards are beautiful. That flower card is absolutely stunning! Love, love, love it! Both of your cards are so lovely! Just beautiful! Now that IS SO CLEVER...using the pineapple to make a window card, brilliant. And I love that you used those watercolor flowers with touches of gold to enhance this wonderful sentiment. I love your second card! It's making me think seriously about purchasing the Lovely stamp set! Thanks for sharing your creativity with us. I love how you colored the flowers, makes me want to get out my Distress Ink! Beautiful cards, and your colors are so pretty! Both really lovely cards. Thank you for sharing. Very pretty; the Stay Golden set really is fantastic. Such pretty cards! 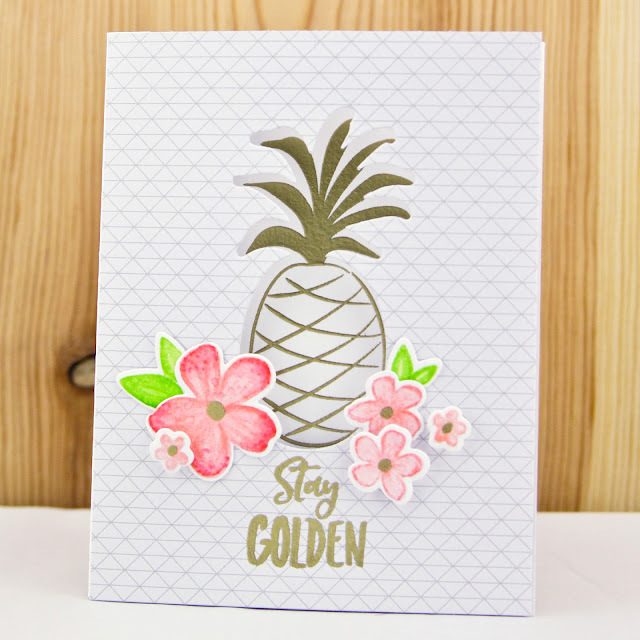 Love the idea of the cut-out for your golden pineapple, and your watercolor flowers are wonderful! Beautiful cards! I love how you kept your designs simple it really shows off the dies and stamping well. I just love a good peek-a-boo card!! Such a fun new release! I agree with you about the sentiment. It is wonderful for everyone. Your flowers are just beautiful. Great job on the cards, Carly! Thanks so much for sharing with us and for participating in this great hop and giveaway. Fantastic Cards. Love what you did with the pineapple stamp and die set. Thank you for sharing your ideas and being part of this wonderful new release giveaway. Oh Carly, your cards are amazing. I too love the sentiment on your second card. We should all have it in front of us when we wake up n the morning! Just beautiful! I like that your flowers are so just accented with the water color effect and not line detail. Love both of your cards, but the pineapple one is really pretty with the white background and gold embossing. Fabulous new pineapple set! Your cards are fantastic and I love the addition of the wonderful floral stamps, so pretty! love the elegance of the pineapple card. Missed seeing you last time I was in at the shop. Hope all is going well now. Thanks for sharing 2 totally different uses from the Stay Golden set. Love the watercolored flowers ! The Lovely sentiment set has so many great sayings. I think I need both these sets, plus the dies!!! These both are so pretty. Love the way you used the flowers on the second card & you are right about that sentiment. Thanks! Beautiful cards! Those watercolored flowers are amazing! Very sweet cards! I love the stunning simplicity of you are enough! Great cards! I especially love the watercolor flowers. very cute cards!!! yess the lovely stamp set is very nice with all its sentiments!!! Oh my, love the way you've used this stamp set, including those pretty flowers. I do love that the set comes with both images and fabulous sentiments. Fabulous cards! What a wonderful release! Your water colored flowers card is gorgeous! and embossed it in the gold. The flowers on the other card are so delicate. What a beautiful color combo. Looking at your cards was a simply joyful. Great colors! Cute cards! I love that you used the Both the die cut and the left overs to add the dimension on the first card. Thanks for sharing both cards. Both of your cards are great; so fresh and pretty. Love the way you die cut the pineapple from the front of your first card. And the water colored flowers on the second are lovely; like apple blossoms in springtime! TFS your talent and inspiration for using these new products. What a great release!! Wonderful cards, love the pineapple card and those lovely little water colored flowers on your second card are super. Thanks for sharing. Your cards are beautiful. Love the sentiments you chose. I love your pineapple card. The colors of your flowered card are so pretty. Your first card was great but the second one with the beautiful sentiments was colourful and peacefully beautiful. Your work is amazing. Oh how pretty! Love your watercolour and gold combination! So soft and elegant. two gorgeous cards, Carly - hard to choose a favorite! Thank you so much for sharing your beautiful cards. Love the flower cards. Love the cards! Those watercolor pink flowers are beautiful. Cute cards! I love all the flowers (on both cards) you did. The colors are great! Such pretty cards and an awesome new release. These are beautiful cards! I thought I knew what my favorite set was when I started the hop, now all of them are my favorites! Love how you created the window on the first card and I love the second card - the water colored flowers and the great sentiment. It's beautiful! I love the golden pineapple, but the flowing flowers were fantastic! So beautiful. Thank you! Loved your cards. The colors and background on the pineapple card were wonderful! really lovely set of cards! love how you created the window with the pineapple die! I love the "you are enough" card, so pretty. Wow!! !I love your first card with the pineapple window - such a great technique with the pop of color on the front. Fantastic idea and execution. Hi Carly ~ So glad to meet you here!! Your cards are gorgeous and I love the Distress Ink colors you've chosen to use on your flowers along with pops of gold; such a nice pairing. Very nicely done. The phrase, "You Are Enough" is one I've always told my now grown children, especially when they were having a not-so-great day. Thanks so much for sharing. These cards are so pretty! Love the coloring. Glad you shared! Love..Love..Love the flower card so feminine..yet strong! So positive! Love how soft your color palette is. Love the "you are enough" card. Very nice! Oh, how I love how you used the dies! Great ideas! Love the peonies card especially!! LOVE your cards! So pretty. I love these cards.The cut out pineapple in gold is beautiful and I love the flowers on both cards. The sentiment on the second card is all anyone needs to know. So pretty! Especially loving the second one, all those little blossoms are gorgeous! Love your soft colors coupled with he gold and vellum, very striking and beautiful! Awesome being on the hop DT with you! Loved the flower card so much. Just beautiful. Lovely,soft pastels. Clean and simple lines. So elegant. Your flower card is beautiful. The pineapple card made me stop and think. Both are exceptional. Clever use of the pineapple, Carly, & I love all your pretty flowers. Pretty cards with a more pastel look. Love all of the colors you used! 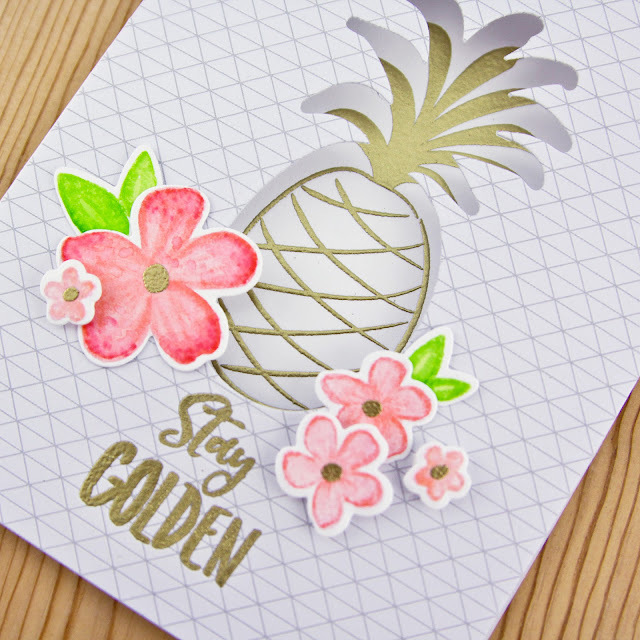 The gold pineapple looks amazing against the simple triangle paper and your watercoloured flowers are so pretty in the pinks and yellows! I love the script of sentiments in Lovely! Thanks for sharing! Beautiful cards! I love that the new pineapple set has different sizes! Great card, love the flower card! Amazing release!! love how you used those flowers! Thanks for the chance to win. Nice cards!!! Very clever to use the pineapple die as a window. Love it! I like the soft colors. Awesome cards. I love the Pineapple stamp set. I loved the Sock Monkey stamp set!!! So funny! LOVE your cards and this amazing new release!!!! Amazing, stunning cards!! I mean, just wow!! Very pretty cards. Great job! Both cards are lovely, but I really love that second one. Soooo beautiful. Thanks for sharing your talent with us. These are so pretty, so soft and elegant. Excellent artwork! Very creative and very inspirational! Wow! Love the first card with the golden pineapple. It goes so well with the beautiful sentiment. And the blooms on both the cards are absolutely gorgeous! Totally in love with the new release! Your golden pineapple card was my favorite and brings back memories of my hometown of Honolulu. The card is do fresh and tropical. The bloom card is just as pretty and looks so fragile as blossoms should be. So creative to do the pineapple inset! And I love how you pulled the flowers from the same set for a totally different and equally beautiful type of card- thanks for inspiring ! Super great cards, carly!! I love your watercoloring, so prettyyyy!! Both cards are so pretty! Love the golden pineapple and the soft palette you used on the second card. TFS. Yummy pineapple card. The watercolor flower card is so soft and lovely. Just very feminine. I love this. Carly! These are so very sweet! Love them both! I love the "you are enough" sentiment! Love your cards! I just love this Stay Golden stamp set & dies! If I can only afford 1 set from this new release it will be this one! It is so versatile & fun with awesome sentiments. Your card is lovely too using the stamps & dies. I love how you wrapped golden thread around your flower card & the way you wrapped it. Very unique! The floral card is perfect! LOVE these, Carly!! Love your use of patterned paper on the pineapple card, and the flowers on the second card are beautiful!!! 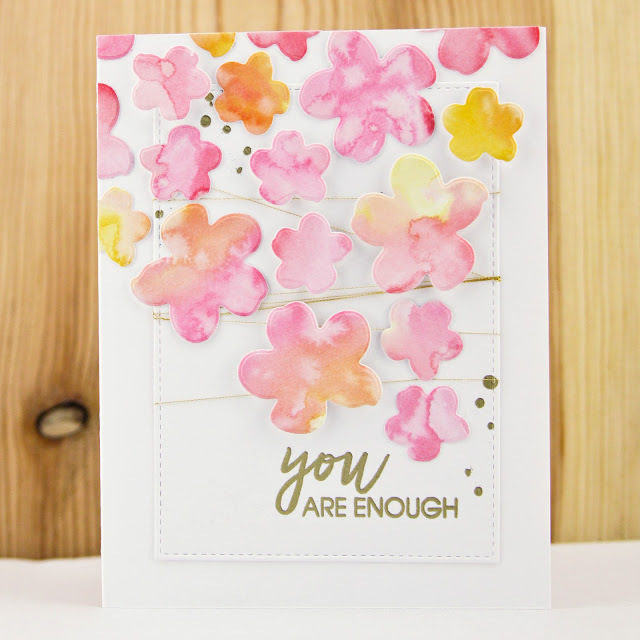 The flower card is so soft and feminine, and I agree the sentiment is great! Gorgeous cards. I love how you die cut the pineapple on the front of the card and put the pineapple on the inside of the card. Thanks for the inspiration. Wow that pastel coloured card is stunning!!!! Love it so much! I really like the way you did your pineapple card. Super cute! That Lovely sentiment stamp is a "must." Beautiful cards! Love the shadow look on the pineapple. Thanks for sharing on the blog hop. Both cards are lovely! Beautiful coloring. A very pretty watercolor card! So soft and lovely! I am definitely going to steal the watercolor flower idea!!! It''s just lovely and goes nicely with the background. LOVE IT!! Thanks so much. That pinapple looks delicious on the card and the flowers are so pretty. Oh my! I love the pineapple window card! The gold really jazzes it up! You've done an awesome job on the water colored flowers! TY for sharing your crestion! Your cards are beyond beautiful! 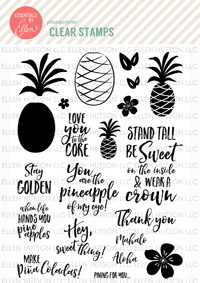 Especially love the pineapple in the negative die cut! Oh how I love your beautiful card of watercolored flowers and wrapped gold thread! And the pineapple window card is so fresh feeling with that background paper mimicking the pineapple's pattern. Thank you so much for sharing your wonderful cards and for the opportunity to win a stamp set from this fun release. Lovely cards Carly. The pineapple window looks amazing on the first card. Such pretty and soft colors. The water colored flowers look fantastic on the second card. Very pretty cards. Lovely new release too. Carly, both of your cards are lovely but I especially love the soft colors of your flowers on the second card. So sweet. Hi Carly! Beautiful cards! Excited to discover you through this Essentials by Ellen release hop. Look forward to seeing more of your artwork when I have more time to check out your blog. One of my FAVORITE sentiment as well. This is the first time I have been to your blog, your cards are beautiful. I love the new clouds and sunshine rays dies. Carly - your cards are gorgeous, and an inspiration as always. Thanks for sharing them with us. Both your cards are gorgeous. What an amazing release. Thanks for sharing. Beautiful layouts and coloring and I love your sentiments! Great cards. I love the pp you used with the pineapple. I love your cards! Great idea showcasing just the flowers from the pineapple set. Thank you for sharing! Thank you for your nice cards! Two soft and pretty cards. Beautiful colors, and fun yet elegant designs. I love the pineapple window! Gorgeous cards, love the look of all those sentiments! I love the water colored flowers! I love what you've done with these awesome new sets, Carly - since I'm a 'words are everything' girl, I really have my sights set on that sentiment set!! Lovely cards. Thanx for your inspiration. Love your cards -- they are so light and airy.. I am in love with the flowers!! Thanks for sharing! Both cards are lovely, but the watercolor flowers really caught my eye. Lots of good stuff in this release and on this blog hop! Beautiful cards!! I love the pastel flowers!! Love the pineapple! Thanks for sharing! I love your card with the flowers. So pretty! The watercolored flowers are so pretty with the gold embossing! Love your pretty card, and that sentiment is just FaNtAsTiC! Love the pineapple window with the golden emboss. Beautiful! Your window card idea is genius! So love it. And the colors on the flowers are so relaxing and tropical. You went all the way with this new release. Thanks! The watercolor effect on the flowers is beautiful. Love how you choose to use thus set. So pretty! Great cards love the flowers so pretty! I just love that pineapple design with the sweet flowers added to it! Beautiful cards, especially with the pretty flowers. Your pineapple card is hands down my favorite so far! Gorgeous cards!! Really love the watercolor flowers!! Both of your cards are beautiful. I love the pastel color choices that make your cards so pretty. Love your fabulous inky flowers! Two great looking cards-flowers are soft and pretty and the pineapple card has a great layout. Thanks for the fun!